For the official start of 30 days of biking I thought it would be nice to do something involving the family but where I could also complete day one of the challenge. 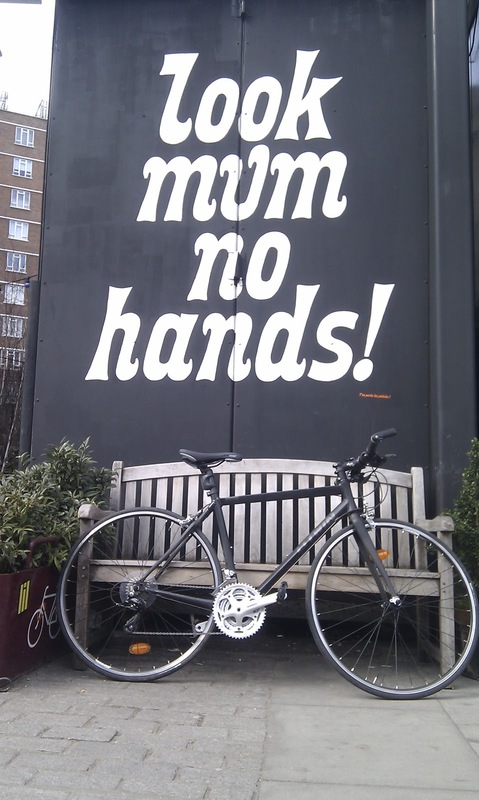 So we decided to go for lunch at Look Mum No Hands - the cycling workshop and cafe on Old Street, in the City of London. The wife and toddler took the tube while I jumped on the bike and met them at Barbican station. 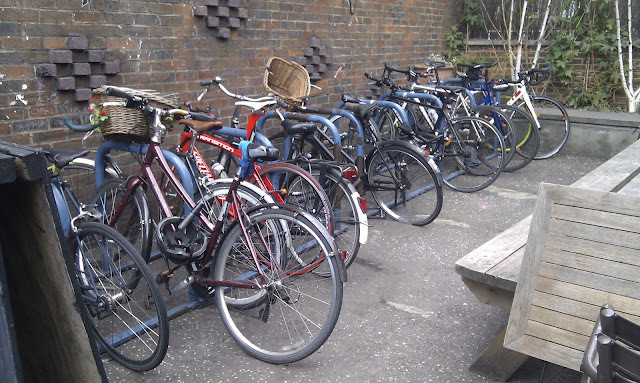 There are loads of cycle racks dotted around the immediate vicinity of the cafe, plus they have a bike rack in their courtyard. If upon arrival you realise that you haven't brought a lock for your bike you can hire one for the duration of your visit. So we sat there for an hour or so watching the mechanic fixing bikes in their workshop and eating our lunch - I had the vegetable curry and the wife had a bagel and croquette. The cafe attracts all kinds of cyclist and also non-cyclists, curious at this quirky looking place with bikes in the window and rims hanging from the ceiling. Once we were done the wife and toddler took a ride on a bus and I hopped back onto the bike and rode a less-direct route back to Westminster. The only negatives from today's ride were a 'white van man' revving furiously at me as I cycled away from a set of traffic lights and the strong, cold headwind that made the ride more of a slog than I would have preferred.